SYRACUSE, NY (WRVO) – Advocates for increased funding of mental health housing programs rallied in Syracuse and across New York State Thursday. They said there has not been a substantial increase in funding for more than 10 years. Unity House of Cayuga County provides housing and other services to people with mental illnesses. Liz Smith, the executive director, says most of the money in their supported housing program covers the cost of people’s rents. As the market rate for rent goes up, the agency is left with less money. Smith said they need more money to recruit and retain qualified workers. She said people can make more working at McDonald’s than her agency. The minimum wage for fast food workers in New York State outside of New York City, is $1.65 an hour higher than the minimum wage for other workers. 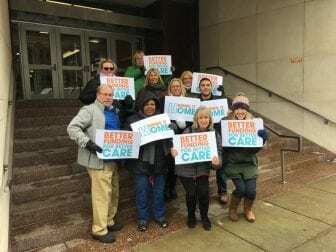 Smith was joined by other mental health housing providers, including Tracey Lord-Mortas, the director of residential programs at Central New York Services, outside the state office building in downtown Syracuse. The group was also previously in Albany, lobbying legislators. Gov. Andrew Cuomo is proposing $10 million in additional funding for housing programs for the mentally ill. But advocates say they want more than $30 million a year for the next five years.